SPRING BREAK! Enjoy your first month of classes in any of our martial arts programs for only $99 (includes school t-shirt, fight shorts, and boxing gloves). This offer is valid only for NEW students is available through May 31st. Why Choose Wisdom Way Martial Arts? Wisdom Way Mixed Martial Arts is a MIXED MARTIAL ARTS ACADEMY WITH CHILDREN AND FAMILY AT ITS HEART! Celebrating 18+ years in Westchester!!! On-going enrollment: join any time! AND first week is FREE! No long-term contracts or test fees! Special tuition rates for families! Wisdom Way Martial Arts in an official (1) Superfoot/Joe Lewis Martial Arts Systems and (2) FEARS Ltd (Fear Enabled Accelerated Response System) Training Center = top of the food chain! So... what are you waiting for? The first week is free, and there is absolutely no obligation. Give us a call or email us today to schedule your FREE trial week. Our phone number is 914-738-7700 or email us at kyosah@wisdomway.net. Make that call, and be on the way to fitness, confidence, and self discipline. Still have doubts? 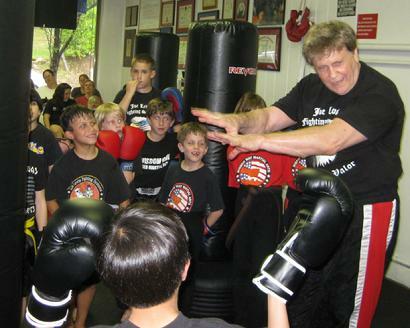 Read what others are saying about Wisdom Way Martial Arts. Wisdom Way Martial Arts Inc.
© 2000 - 2019 Wisdom Way Martial Arts Inc. All rights reserved.